Jungle Red Writers: Missing Downton Abbey, or are we? So it's a good time to reflect what we love so much about Downton. The story is pure soap opera, isn't it? Man with mad wife. Illegitimate children. Returning Russian prince. Evil servants. Good and long suffering servants. It's all over the top and if it were in a contemporary setting it would be relegated to daytime TV. One of the things we love about it is that it is Downton Abbey, fictitious home of the Crawley famly. We are fascinated by a lifestyle we can hardly imagine. Oodles of servants. A maid waking you with morning tea. Elaborate meals. Hunts and balls and shoots. And gorgeous clothes. I think we love the clothes best of all. It seems we can't get enough of the lifestyle of the rich and famous a century ago. 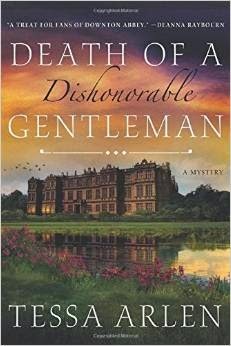 A few days ago I enjoyed meeting a new writer called Tessa Arlen who has written a mystery called Death of a Dishonorable Gentleman that takes place at a costume ball at a stately home. It's terrific reading, giving the reader a glimpse into the lifestyle above and below stairs. Tessa herself is the daughter of a British diplomat and has lived in various parts of the world, including India where I'm sure she had servants to wait on her, like Downton girls. So maybe it's time for a reality check: I grew up in a big English house. Not nearly as stately as Downton but with long drafty hallways down which the wind whistled. And one thing I can tell you about it: It was cold. All the time. There was no central heating. If a fire was lit at one end of a forty foot roon the other end still remained glacial. The bedrooms on my parent's floor had fireplaces, but there were none on the floor where my brother and I slept. Hence the windows would ice up in winter, the wind would rattle the window frames and I would snuggle into a tiny ball, clutching my hot water bottle to keep warm. When I see the Downton people in their elegant silk dresses I always think "You were freezing cold, remember?" Quite possibly everybody smelled bad. Lower class people only had one dress for weekdays and one for Sundays. They covered them with an apron. Men didn't change their shirts every day. They changed their collars (hence the need for collar studs). And we call them the good old days, but were they? It seems that at Downton they enjoyed a succession of lovely meals and house parties, but in reality the life of an upper class woman was one of boredom. Meals punctuated long dreary days writing letters, wandering through the gardens, reading and playing the piano. Houses were a good distance from each other so it was often a life of loneliness with the husband busy with running the estate or with his business and the wife with nothing much to do except entertain on rare occasions. The only chances to meet young men were those deemed suitable and introduced by the family, and then there was no real chance of getting to know them beyond a brief stroll in the gardens. No wonder Lady Mary wanted to test out Lord Dillingham's prowess before she married him. No wonder there was bed-hopping when they had company! And those good old days came with no concept of modern medicine. If your cold turned into pneumonia you would probably die. Even upper class women died in childbirth (as we know from Lady Sybil). My grandmother lost a child to scarlet fever and one to meningitis. So would you really have wanted to live then? Or are you content to enjoy their life vicariously through our books? My next Lady Georgie is called Malice at the Palace and will give you a chance to live like a royal! I must confess to wondering what Maggie Smith's announcement would mean for the show . . . . I really, really, really hate being cold in my home. Thinking of when the power went off a few years ago and I thought I could stick it out for that week with a down comforter and oil lamps. Ended up in the hospital. So, no. I like modern comforts and really appreciate modern medicine! I agree with Joan Emerson. I love the spectacle of "the good old days" (although I'm not a DA fan), but no, I'd never have wanted to live back then. Too much of what we take for granted now didn't exist. I'd probably be confined to a wheelchair by now. I love my creature comforts now, but I also love the fantasy of Downton Abbey. And even if it is a soap opera. I love the characters and finding out what will happen next. It's why I love series in books - the story goes on and on and I get to keep in contact with the characters. I'll miss it and look forward to next year. I empathize with your cold familial home, Rhys - we have (inefficient) central heating in our 200-year-old house, but the cost to keep it actually warm is staggering, so we usually have the downstairs at 60 during the day. Lots of sweaters, and when I work, I wrap a throw around my legs. So I, too, have wondered how the Crawley girls manage in those beautiful sleeveless evening dresses! Since the Earl installed a telephone and electrical lighting, perhaps he (or more likely, Cora) was also ahead of the curve on central heating. I suspect the allure of living like Downton Abbey is that we all picture ourselves upstairs taking tea in the salon instead of downstairs, blacking boots or scrubbing dishes with some nasty lye-based soap. All of which goes to show that in any era, it's nicer to be rich than poor. Good point, Julia. We always picture ourselves as one of the Crawley girls, never Daisy. And their lives were hard, not because they were badly treated but because work was so physical. Imagine sweeping those carpets with a brush before vacuum cleaners, trying to clean that stove with corrosive materials that took the skin off hands, or even carrying buckets of coal for miles to light Lady Mary's fire before she awoke. Rhys, I've thought exactly that, about how hard the corrosive chemicals and cold water must have been on servants' hands, when I see the upstairs maids and menservants sitting down to polish silver, blacken/polish/clean shoes, etc. And poor Daisy, she has her hands in water all day long, for three big meals a day. No, thank you. As for the boredom, maybe that explains Lady Mary's horrible bitchiness. Can you tell she's not my favorite character? One thing I have been thinking about is how the 21st century "production values" put such a sheen on "olden days." If we look back at old black and white versions, we can see the darker places (I am thinking of, for example, "Wuthering Heights"). In the village near Downton Abbey, there is barely a glimpse of mud or dust, poverty, hardship -- even the peasants live in clean and charming rooms. Is there a contemporary producer or director who can recreate the past accurately? In DA times, I almost certainly would have been a "downstairs" person, so I'm happy to be living here and now! I'm grateful for antibiotics, modern surgical procedures, central heating, etc. There is a book with a title something like "The Good Old Days; They Weren't So Good". A teacher I know who read it said that back in those "good old days" in the 1800s there were lots of incidents of violence of pupils against teacher. She was happy with her own modern "problem" students! I'll have to call upon my love of time travel imaginings to answer the question of living in earlier time periods. Under the immunity of time travel, as I would be immune to diseases that ravaged the past, I would take a close-up look at major historical events and also everyday life. Oh, wait, I can already do that through Rhys' and Susan's books. I am good with that. I wouldn't want to permanently be stuck in a period where my modern conveniences weren't extant. And, FChurch, I feel your pain. When we had our giant ice storm about four years back, the power was off for five days, and I stayed in the house for three of those days. My son was here, and his friends helped get wood for the fireplace, but I had to be sitting right up in front of it to feel much warmth. Piling blankets and quilts on the bed at night kept the worst of the cold at bay, but unfortunately, one can't stay in the bed or in front of the fire all the time. There are bathroom needs and some eating needs. It is hard to believe just how cold a house can get in the winter during an ice episode with no heat. I would go get coffee at the Quick-Pik every morning, and the car felt so good. I finally couldn't take it any longer, and my son and I went to my mother-in-law's to stay the last two nights before power was restored. You tend not to take your heat for granted like you did before such an experience. Rhys, I don't know how you stood the cold of your house when you were growing up. Deb, we ate lots of calories--all those steamed suet puddings etc and we walked everywhere so the blood was circulating and we wore wool next to the skin. My school was equally cold. Built on a quadrangle, one side was open cloisters and we wore square neck blouses that did nothing to keep out the cold. I guess we were tough. Okay, Rhys, now I know your descriptions of Georgie's family homes were totally based on reality. Brrr, just when the temps got above freezing, finally, I feel chilly all over again. I'm sort of lukewarm to Downton these days, though the dresses and Maggie Smith remain favorite things. The new addition of actor Matthew Goode (seen flirting with Mary in the finale)is also a favorite thing. I hope he appears in the next season. Sigh. You do a great job in the Lady Georgie books of showing how downright dreary and drafty the houses were. I wonder if they are still like that? Argh, I'd never be able to stand it. Hullo Rhys _ I couldn't agree more with you about how cold houses were when I was a child in England.NO central heating and hot water was provided by a boiler in the basement and had to travel miles of pipes to get to the bathroom. We used to call the frozen window panes "frost flowers" because our frozen breath made such lovely designs! We had one bathroom in a seven bedroom house, with a massive bath tub that could never be filled with a comfortable amount for a nice long soak. Yes, the house was beautiful but the drafts were outrageous! Loved meeting you the other day in Scottsdale - came home and order The Edge of Dreams! Running in...just off a plane! Happy to live now---and love DA. Why I love historical mysteries: a window of sorts into the past without actually experiencing the downside of it. Plus, one usually hangs out with the upper classes where it is a little nicer. Cant wait for the next Lady Georgie! At an award show yesterday, Hugh Bonneville confirmed Downton S6 will have a Christmas Special/9th episode.